Join Us For General Granbury's Birthday Party! Join Us For General Granbury&apos;s Birthday Party! 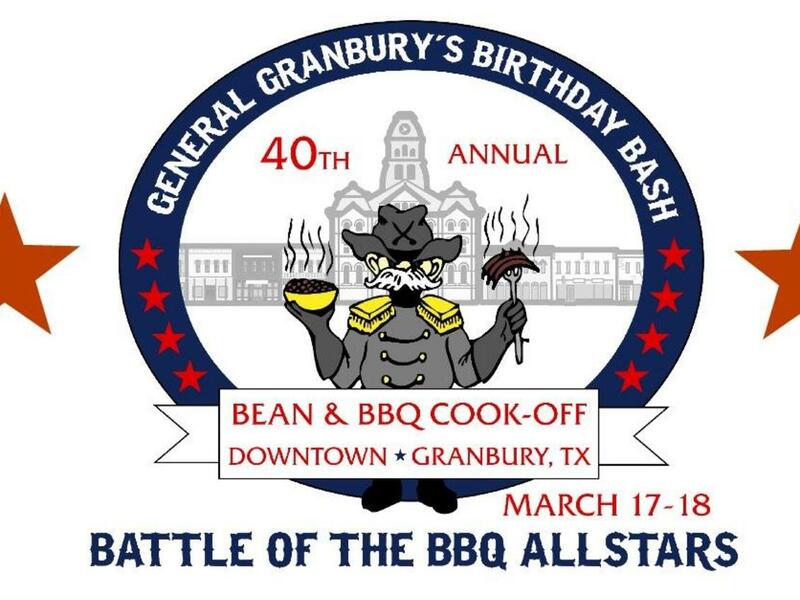 On March 17th and 18th, prepare to celebrate General Granbury’s Birthday on the Historic Granbury Square! There are so many fun activities planned. Everything from a parade, to an outhouse race, to a Bean & BBQ Cook-Off. And you will not want to miss the St. Paddy’s Day Pub Crawl the same weekend! Event chair Sara Miskovik says, "I am so excited to sample some of the very best barbeque from all of the talented foodies, and listen to fantastic Texas music!" The fun gets started at 9:00 a.m. on Saturday, March 17th. Food and craft vendors will open in the Square. Then at 10:00 a.m., the opening ceremony begins. The national anthem will be played, and cake for the General’s birthday will be served. At 11:00 a.m., the Bean & BBQ Cook-Off begins. Aspiring pit masters will compete for cash prizes, gifts, and trophies for best ribs, brisket, and beans. Cups for bean tasting are available for $2.00. Saturday, the pit masters are preparing ribs. Sunday, they are preparing brisket. Apply here if you think you have what it takes to be a BBQ All Star: Bean & BBQ registration. At 11 a.m. the Granbury Cloggers hit the main stage. The Granbury Cloggers have been clogging since the 1980’s. They are fantastic to watch, and always a highlight of the weekend! Everyone loves a parade! At noon on Saturday, we will have a parade to commemorate General Granbury’s birthday. The parade starts at 600 W. Pearl Street, and goes around the Square. Apply here to participate in the parade: Parade Application and Rules. At 2 p.m., a memorial service for General Granbury will take place at Granbury Cemetery, at North Houston and East Moore streets. The Bean Eating Contest is at 2 p.m. on the Square with prizes and trophies up for grabs! This activity will have your whole gang laughing! A Bean Queen will also be crowned on Saturday afternoon. We even have something for race fans. Outhouses built for speed will compete against each other at 2:30 p.m. The epic race begins at the corner of Crocket and Pearl. If you are interested in competing, grab two buddies and build a racing outhouse. You can see the rules and register here: Outhouse Race Application and Rules. From 3 p.m. to 5 p.m. on Saturday, the Tejas Brothers perform on the main stage! The Tejas Brother are Tex-Mex honky-tonk--and are a great dancing band! At 5:15 p.m. on Saturday, the Cook-Off awards for beans and ribs will be presented on the Square. Trophies, gifts, and cash prizes will be presented in several categories. Don’t forget, it is St. Patrick’s Day on Saturday, March 17. What would St. Patrick’s Day be without a pub crawl? The St. Paddy’s Day pub crawl begins at 5 p.m. and runs till 10 p.m. The crawl takes place on the Square. Tickets are $25 and include a drink at each location. Participating “pubs” are 1890 Grille and Lounge, D’Vine Wine Granbury, Christina’s Bistro, Ketzler’s Schnitzel Haus & Biergarten, and Farina’s Winery & Café. All pubs are within walking distance. Tickets may be purchased from any pub or online. The festivities get started again on Sunday at 10 a.m. Vendors will open, and Bean & BBQ Cook-Off begins at 11 a.m. Bean cups will again be available for $2.00. Music on the main stage begins at noon and from 2:00 p.m. to 4:00 p.m., and Texas Country star Phil Hamilton appears. Phil will play hits from his albums Nothing to Lose and Renegade Rock N’ Roll. At 2:30 p.m., judging begins for the best bbq brisket. At 4:30, prizes are presented for the best bbq! We hope you can join us for a fantastic weekend of fun. 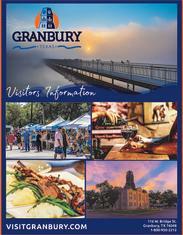 VisitGranbury.com has all the details on how to plan the perfect stay here in Granbury!